The article “In Sag Harbor, Library Opens New Chapter” was featured in the Wall Street Journal, on the front page of the Greater New York section, July 28, 2016. The John Jermain Memorial Library is a Suffolk County association library like the Westhampton Free Library. Unlike the WFL, however, the JJML Board amended its by-laws in 2004 to change from an appointed board to an elected board. WFL Board King, um President, Tom Moore, appointed by Joan Levan, spent tax dollars hiring labor attorney Richard Zuckerman to deny us our election of trustees. We taxpaying subjects were told that changing to an elected board could possibly, conceivably, bring up issues of civil service and prevailing wage that perhaps could one day in the future negatively impact the Library. The John Jermain Memorial Library has had an elected board for a dozen years and–look!–no negative issues of civil service or prevailing wage to justify the Board’s denying their taxpayers their right to vote for trustees. Please read The John Jermain Memorial Library Expansion and Restoration Process Fact Sheet to see how a democratically elected Board operates. Around 2005 the JJML Board “invited all community organizations to appoint representatives to a Community Library Committee to assist them in determining the best approach for the expansion of library services.” Twenty-four community leaders participated. In June 2006, this committee concluded that a community-based Library Development Committee be formed. Nearly forty residents participated in the Library Development Committee. 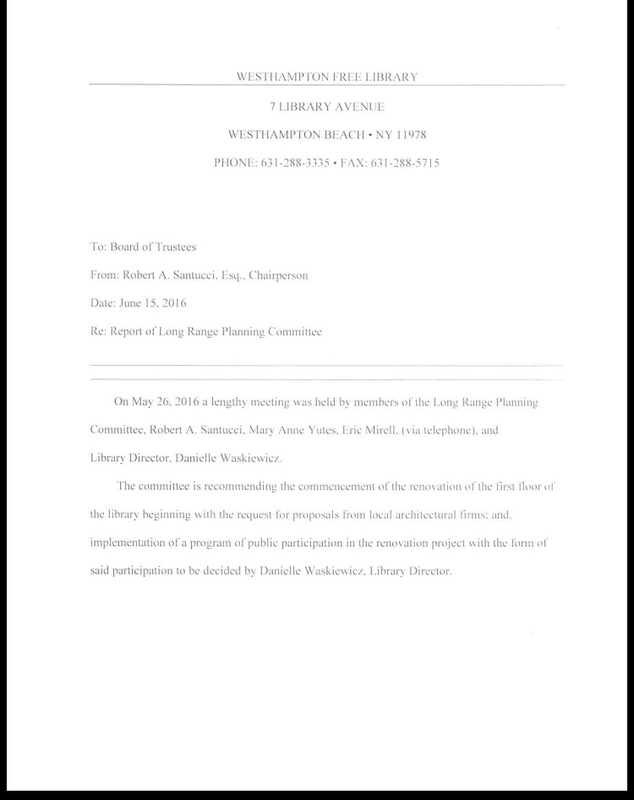 Contrast this with the Westhampton Free Library’s Long Range Planning Committee. This committee is comprised of three appointed trustees and the Library Director. This committee is recommending commencement of renovations to the first floor of our just 6-year-old building to the tune of $624,000, Interior Space Redesign, among other capital renovations/expansions. Yes, Ann Skovek’s $1.3 million donation is earmarked for the attic. But the Interior Space Redesign, the $1 million for a new parking lot and $100,000 for the HVAC system is primarily accumulated tax dollars, we believe, based on reading the Library Audits (see The Library’s Slush Fund). What we’ve been told by Joan Levan’s Board and the Library Director for the last few years: The Teen Room will be moved into the attic, encompassing half the space (though how many teens actually spend time in the Library?). The DVDs in the front lobby will be moved into the Teen Room and the DVD area will be reconfigured with comfortable seating. The Children’s Department staff desks will be moved from the back of the first floor up to encompass one quarter of the attic; the remaining quarter of the attic will remain storage. In addition, they want a boardroom. Wake up taxpayers! I think we are being duped, deceived and fleeced by a private club.